Dinosaurs sure are fun. But a dirty dinosaur is, without a doubt, an even more fun dinosaur than a regular dinosaur - that is my opinion, and I'm sticking to it. Let's face it, kids love to get dirty. 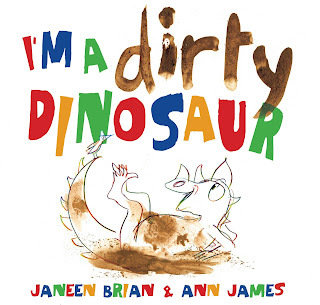 They love to roll in the muck and LIVE life to the full, and so does the sweet little dino in this new book from Janeen Brian. Dino starts with a grubby nose. Then a muddy face. Next comes a scummy tum and filthy feet and tail. But does he care? No way! He's too busy jumping in puddles and rolling on the ground and having a great deal of fun. Will he ever wash again? This is a gorgeously-designed book with thicker-than-average pages, making it much hardier for little ones. I'm absolutely loving the rounded corners of the firm cover, too, and Ann James' illustrations only lend further to this book's stand-out qualities. I'm simply loving her happy, rainbow-coloured line drawings, spattered with mud and perfectly complemented with the brightest of text.